Michigan coaches have been on the road over the last week as the fall recruiting period opened up. The Wolverines have checked in on their commitments, but also a host of 2016 and 2017 prospects over the last week. Here’s a rundown of some of prospects that Michigan has checked in on over the last two weeks. Michigan coaches have been on the road over the last week as the fall recruiting period opened up. The Wolverines have checked in on their commitments, but also a host of 2016 and 2017 prospects over the last week. Here’s a rundown of some of prospects that Michigan has checked in on over the last two weeks. As a reminder, you can track all upcoming and recently reported Michigan basketball recruiting visits here. Michigan was in to check in on Amir Coffey, one of the lone remaining class of 2016 targets on its recruiting board. Coffey recently took an official visit to Minnesota, where his father played, and also canceled an upcoming official visit to Texas — leaving Gopher fans feeling optimistic. Alabama has also been in to check on the talented guard and the Wolverines could be an option if his recruitment extends into the spring. John Beilein had an in-home visit with Bailey, who is planning an official visit to Ann Arbor on the 26th, and the top-50 wing prospect called Beilein a “very genuine coach.” Bailey is a class of 2016 prospect, but he’s planning to take a two-year mission which means he’s far more likely to be a member of the class of 2018. Bailey also has a scheduled official visit to Gonzaga in early October. 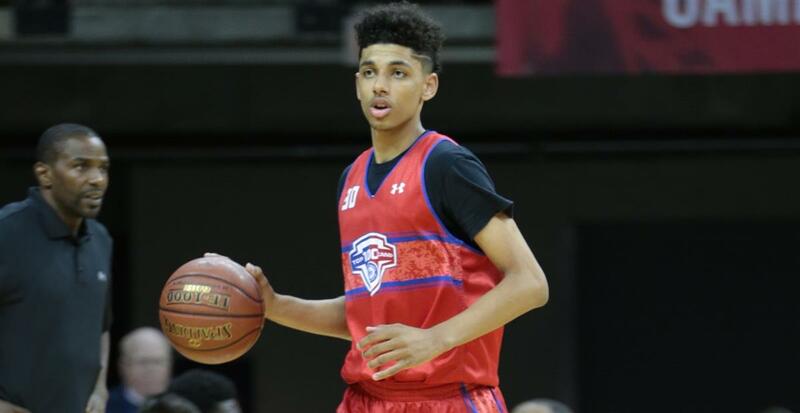 Brian Bowen made the move from Saginaw Arthur Hill to La Lumiere for his junior season and drew head coach John Beilein down to Indiana for a visit. Bowen’s mom praised Beilein for making the trip to La Lumiere on his own and provided 247 with a brief update on Bowen’s recruitment. Wilkes has emerged as a five-star talent this summer and the five-star prospect has risen up to No. 17 in the class of 2017 according to 247Sports composite. Kentucky, Ohio State, UCLA, Butler, Michigan, Michigan State, Illinois, Vanderbilt, Louisville, Georgetown, Indiana and a host of others have been keeping tabs on Wilkes. Another College Practice Camp visitor, Gunn is an effective scoring wing from Indiana. He’s a bit of a tweener right now, but projects as a shooter with size and potential to play the wing. Michigan, Indiana, Iowa, Ball State, SLU, IUPUI and Northern Kentucky are some of the schools that have been in to watch Gunn this fall. Michigan checked in on the five-star point guard from St. Louis over the last week. Michigan has been noted as keeping tabs on Young several times, but a visit doesn’t seem to be in the cards quite yet. His next scheduled trips are to Kentucky for Big Blue Madness, Kansas for Late Night in the Phog and UCLA. Floyd was one of the higher profile visitors at Michigan’s College Practice Camp in June. He’s ranked 153rd nationally according to 247Sports Composite rankings and John Beilein was in himself to check in on the combination forward. Baylor recently offered Floyd and his most recent unofficial visits were to UNLV and San Diego State. LaVall Jordan was in Milwaukee checking in on Poole, the No. 95 player in the class of 2017, last week and Poole will reciprocate the interest with a visit this weekend. Poole is a combo guard with offers from Marquette, Illinois, Drake, Bradley and others. Jay Jay Chandler emerged on the national scene at Nike’s Elite 100 event for underclassmen this summer. He’s a 6-foot-3 athletic combo guard from Houston with offers from Oklahoma, Creigthon and others. He’s currently ranked as the No. 47 player in the class of 2017 according to 247Sports’ Composite. John Beilein stopped by Findlay Prep during his swing out west and checked in on Tillman, a Michigan native, at Findlay. Tillman is a strong-bodied inside-outside forward who picked up offers from Marquette and USC this week. West, a point guard from West Virginia, visited Michigan in August and the Wolverines were in to watch him this week. West has interest from Marshall, Wichita State, Liberty and others. West’s father is known for this shot to knock Cincinnati out of the NCAA tournament. Michigan was in to watch Jackson, one of the most productive point guards in the state of Michigan, this week. Jackson has visited Ann Arbor a number of times for camps and a full unofficial and he has everything except size in his arsenal of skills. Jackson’s AAU teammate, Kithier had a strong showing at Michigan’s College Practice Camp in June and the Wolverines were in to check on him.